How is it Monday again? We had a really fun weekend! We were in La Quinta for a short desert/Christmas getaway with good friends. 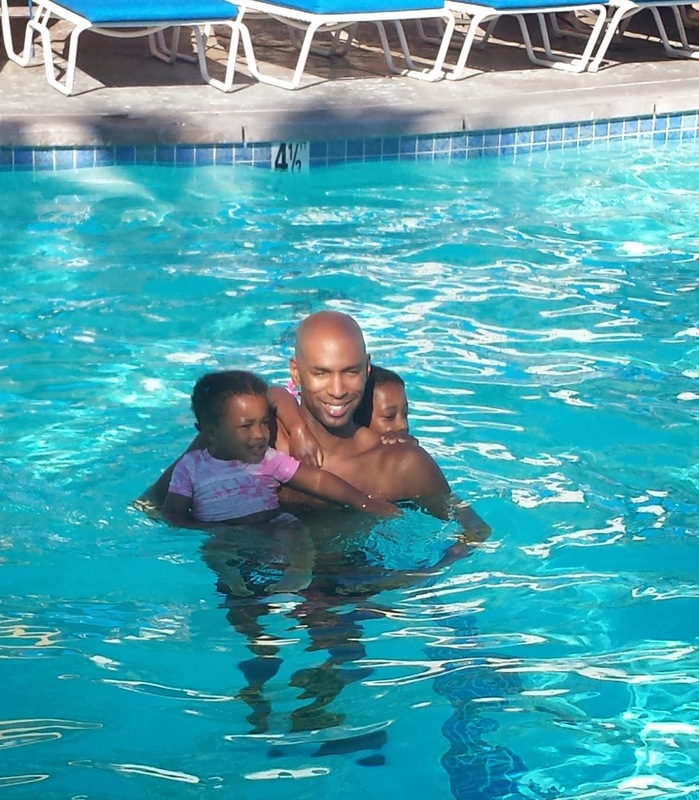 The kiddos had a blast in the pool and just hanging out. Okay, so let's get back to the title of this post "A little injury, a little grumbling, rainbows are coming." After the Ventura Marathon in September, I took a week completely off from running and then slowly started running a little bit the second week - I ran 3 days that week. The third week I ran 4 days and by the fourth week I was running five days. Then my knee started hurting. I figured it was my body healing from the marathon. After all I had done short races and a half marathon, but had not done a full marathon in a LONG time. 10 years to be exact - I ran the Chicago Marathon in 2004, with a PR of 3:23. I had since birthed three babies and nursed them, chased them around as toddlers (which is what I am doing with our youngest!) and raced a little bit, but had not run another marathon. Maybe my body was like: "What is this all about?" So, I scaled back a bit on the running in the beginning of October and then after about a week started running again very consistently. I tried to run on dirt and grass whenever possible. The knee still kept nagging, nagging. Then it got extremely (NOTE: I have never had any type of knee injury or pain before) painful and I knew it was time to go to the doctor. I found an orthopedic doctor in my town and made an appointment. The physician's assistant was able to meet with me right away. My first choice was the doctor, but that would have taken another week for an appointment and I was told the PA was great for a first visit. 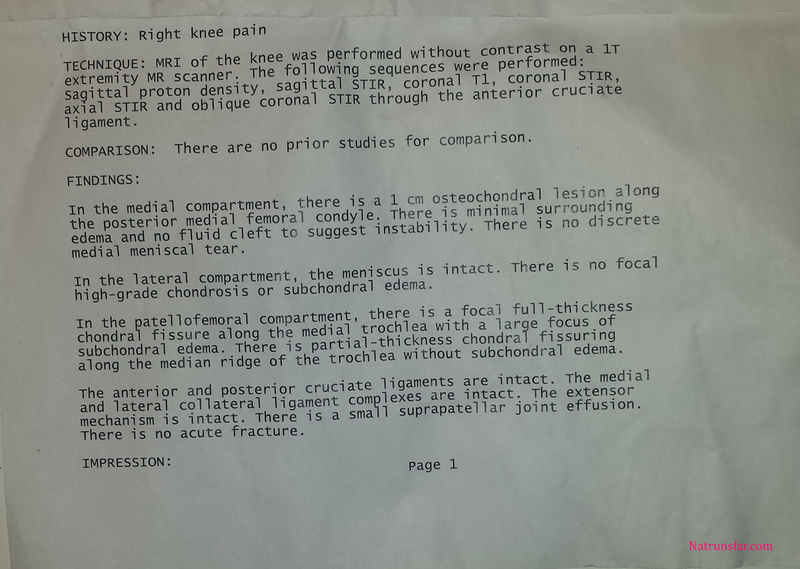 The PA examined my knee and took some x-rays, but I knew in my heart that I would need an MRI. 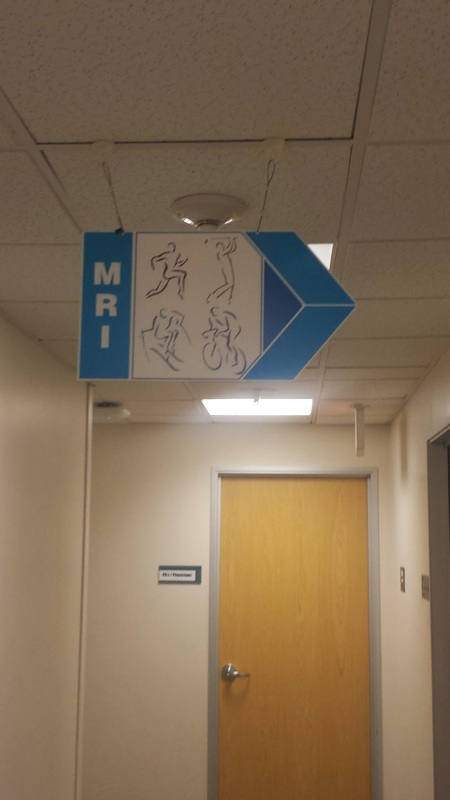 Yep, they scheduled the MRI. "Boston is coming. I need to get this figured out soon so I can start building my base again." "Arrgh! Why is this happening NOW?" "I'm so glad this is happening now and not 3 months from now!" Prescription was to take 2 weeks off from running completely, (every runners nightmare) get the MRI and come back to talk about the results. 2. I got the appointment! I found out that there is a little bit of swelling and a slight fissure along the median ridge of the trochlea. 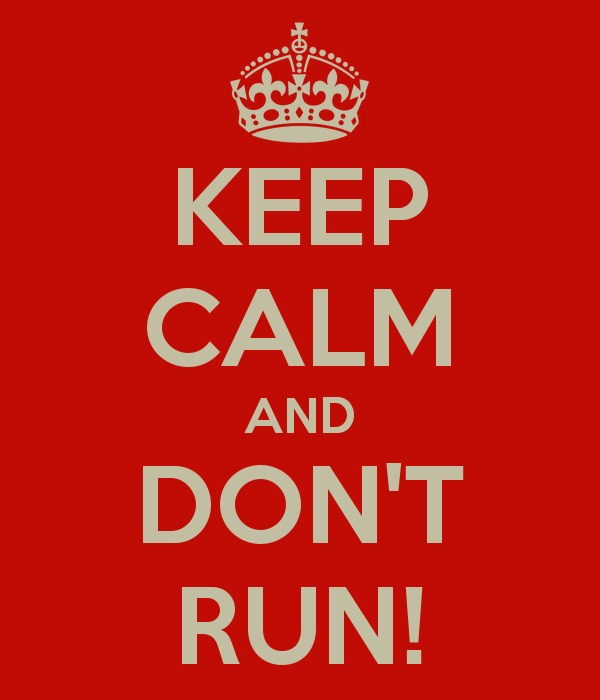 There is no sign of a stress fracture and that I should be fine, I won't need surgery (thank goodness) - just take 2 more weeks off from running (NOOOOO!!!!!) and then get another MRI. There was also talk of getting some injections in my knee if necessary to help with pain and swelling. At this point I am meeting with the PA - who is great -and she wants to let me be on my way, she just has to get it cleared with the main physician. 10 minutes later she returns and tells me: "The doctor is concerned about your knee. Let's get you in right away for another MRI and then have you come in and meet with him right away." Okay. Deep breath. I am processing the fact that I have to take another two week break from running. I was really on a roll and this is not what I needed right now. I went in for the MRI today and am meeting with the doc on Thursday which is good news. By the way, the wonderful thing about getting an MRI is that they give you a blanket and several pillows, turn on classical music and you can lie there for 35 minutes and take a nap if you want. You have to lie very still, so no reading. I am a Mom with three little kids who got to escape for 2 hours in the afternoon. On a Monday. OF COURSE I took a nap. Tomorrow will be one full week off from running and by December 23rd I will be running again! I am having visions of a beautiful Christmas Eve morning run, followed by a fun filled day of making cookies with my kiddos, going to church for our Christmas Eve service and the whole magic of spending the evening together getting ready for Santa. I am having visions of a peaceful Christmas Day run and reveling in the joy of presents, stockings, eating and family. The week of Christmas will be 18 weeks till Boston. 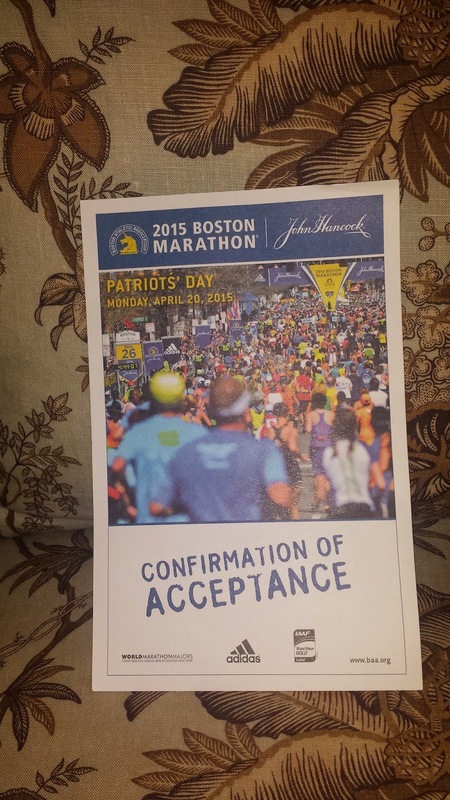 That makes me a little, teeny bit nervous because for my last marathon I trained with an 18 week program. This time around I have been fiddling with going for another 18 week training program or just doing a 12 week Boston focused program. My plan was to run a half marathon on December 21st, but that clearly is not going to happen now. The GOOD NEWS is I am scheduled to run the Surf City half marathon in Huntington Beach on February 1st with a really dear friend of mine. I am very excited about that! Toying with the idea of getting a coach vs. training on my own with a detailed plan. I feel like I need someone to help me fine tune things a bit. How to get through that last 10k - fast. Faster than my history has been. Is my nutrition okay during the race? Should I be drinking more? I finished the Ventura Marathon dehydrated even though I drank at almost every water stop + the Fluid performance drink and GU. The plan is to schedule in some more 5ks and 10ks in the first quarter of the year in addition to my weekly speed sessions to help with my leg turnover. I know it will be great. I am so excited about 2015 and all the great things I am going to do with my running. Focused, stronger, faster - let's do this. I'd love to know - what do you do to stay in shape and keep sane during an injury? 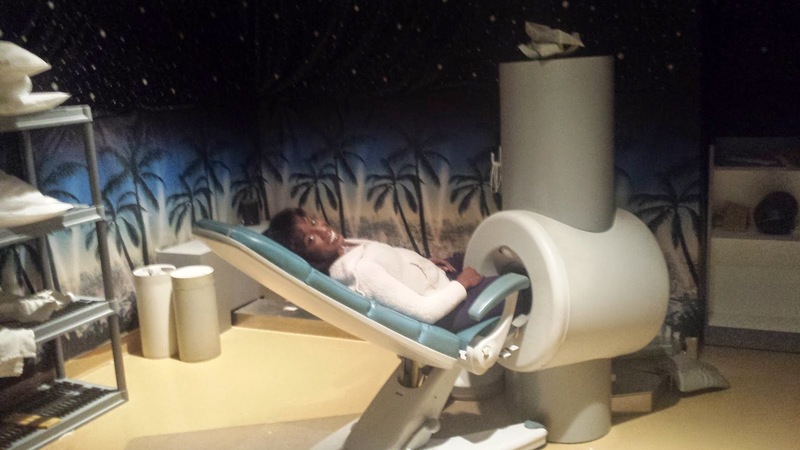 Have you ever had to have an MRI? The rainbow is coming. I can see it, right on the horizon.